This illuminating work outlines the essential principles and techniques that define the art of striking in most martial arts. More than 1400 outstanding photographs introduce over 400 practical techniques encompassing all types of strikes: hand strikes, elbow strikes, standing kicks, aerial kicks, ground kicks, head butts and body strikes, advanced combinations, avoiding and blocking skills, defenses against punches and kicks, and pressure point attacks. Comprehensive introductory chapters provide an authoritative overview of important technical principles, East Asian energetic concepts, and 109 fundamental skills encompassing hitting surfaces, stances, footwork, and basic methods of falling. Precise anatomical illustrations and descriptions of 106 common Oriental pressure points, and a visual comparison of different martial arts, make this an invaluable resource for all martial styles. 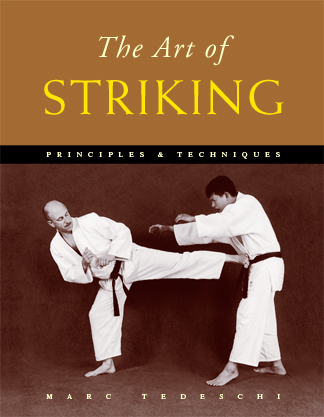 The Art of Striking is part of a remarkable series of books that provide an in‑depth look at the core concepts and techniques shared by a broad range of martial arts. Each of these stand‑alone books is dedicated to a specific technical area, such as strikes, holds, or throws. Other titles include: The Art of Holding, The Art of Throwing, The Art of Ground Fighting, and The Art of Weapons.